Amazon announced earlier this year that it will establish a full retail online store in Australia. Amazon has operated a Kindle store at amazon.com.au since 2015. That website will be upgraded to offer products in a variety of product categories from later this year or early 2018. Local press coverage seems to have focused on likely impact on local big box retailers. What can easily be overlooked is that huge new opportunities for local manufacturers to reach more customers will be opened up. Amazon Australia, as in most other countries, will operate with a dual business model. That is, it will include both products sold by Amazon’s own retail division – the original Amazon e-commerce model of purchasing goods and selling online – and it will include products sold by approved third-party merchants, Amazon’s fast-growing ‘marketplace’ model which now accounts for half the units sold through Amazon worldwide. ExportX has since 2008 been representing New Zealand and Australian brands in the Amazon channel to reach customers in North America and Europe, and is well-experienced in participating in Amazon launches. There are opportunities to achieve additional brand visibility by participating in the early stages. If you’re ready, it’s a great idea to join in at the beginning. 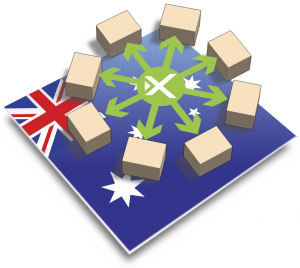 ExportX is expanding to have in place the systems and capabilities to be part of the new Amazon Australia sales channel. I invite businesses interested in selling on Amazon Australia with ExportX to get in touch. Contact us to register your interest.